To be fair, I haven’t read The Maze Runner. So while the prologue with Teresa and Thomas may have resonated with Maze Runner fans, I was just mildly curious. Also to be fair, this series is written for a younger audience, though with the narrative sophistication of contemporary YA, that probably shouldn’t say much. If you like Maze Runner, I hear this book is very similar, and so you’ll probably like it as well. If you haven’t read Maze Runner, this book is still fairly easy to follow, though personally I’m wondering if Maze Runner has a more interesting storyline. The prologue, at least, was intriguing enough to make me curious about the original trilogy. 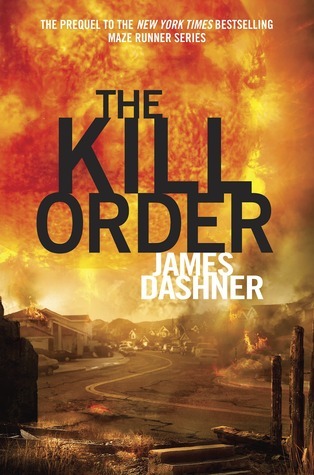 The Kill Order is the prequel to the best-selling Maze Runner trilogy. Sun flares have destroyed a huge chunk of civilization and now a mysterious virus, originally spread by poisoned darts, is turning survivors into raging lunatics. The story follows Mark, Trina and their friends as they struggle to survive. I originally assumed Mark and Trina were teenagers, both because this is YA and because of the way they act. But a passage describes Trina as a woman, so I’m not completely sure about their ages. The Kill Order is mostly an action-packed apocalyptic zombie story. I liked that Dashner showed how Mark and his friends had to sometimes make the difficult decision to leave behind infected friends. I also really like the Mark and Trina romance and wish Dashner had explored that a bit more. The fight scenes are fast-paced and suitably gory, and descriptions of infected individuals are definitely shudder-worthy. Kill Order reminded me somewhat of a simplified, YA version of Justin Cronin’s The Passage. The main difference is that Kill Order focused a lot more on the action at the expense of character development. Dashner has created some interesting characters, in particular the heroic elderly soldier Alec, whose sense of duty and emotional connection to fellow soldier Lana compels him to keep going. I only wish there was more character development. I usually like action-packed books, but Kill Order was mostly just confusing, and I ended up caring a bit about characters’ relationships (e.g. the Mark and Trina romance), but not much about the characters overall. The best part of the novel is when we find out the real reason behind the virus. From an action-packed but mostly aimless zombie story, The Kill Order reveals the beginnings of political commentary. I wish Dashner had explored that angle a bit more — I would’ve loved to find out more about the story behind the people who committed such an act, and how they would’ve reacted to seeing the unintended consequences. I’m unsure if this is explored in Maze Runner, but there are definitely interesting implications from the revelation. This entry was posted in Book Reviews and tagged 50BookPledge2012, Dystopian, Fiction, Random House, Science Fiction, Thriller, YA by Jaclyn. Bookmark the permalink.